In this classic introductory text, the authors aim to identify the new concepts of organic chemistry, to select the ones that are clearly fundamental to the learning of organic chemistry, and then to build them into a framework of the book. The cornerstone of this framework is that chemical behavior is determined by molecular structure. Each topic is presented fully and clearly at a level appropriate for beginning students. The authors emphasize relationships between the seemingly unrelated facts and theories that students are learning in order to reveal the broad and complex pattern underlying organic chemistry. Where possible, they lead the students to find the pattern themselves, by working problems. Do any chemists or (pre-med students) who graduated in the last 40 years not tremble when they hear the phrase 'Morrison and Boyd'? More than 2 million students have used this book, now in its sixth edition." 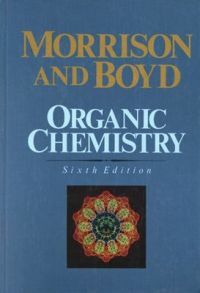 --From Chemistry, Spring 2001 issue in which R.T. Morrison and R. N. Boyd's Organic Chemistry was named one of the Silver Shelf winners in "The Great Books of Chemistry.